Thanks for popping in again. I've been busy today and have made a second entry for the Joy of Sets Challenge Blog along the W theme. This time I've created this card which I'm calling Winter Wonderland. I thoroughly enjoyed making it and used lots of ink and even threw in an embossing folder. So to make this one I took a piece of Whisper White cardstock as my card base, measuring 8x6 and scored at 4 inches. Then I stamped right onto it (bravely for me as I make so many mistakes) using the three stage tree stamp from the Season Like Christmas stamp set. I truly love these stamps and never cease to be amazed at the fantastic image they create. I recalled something from an art class many years ago (I was useless at art and still am) that trees in the background of a picture should bee darker than those in the foreground if you want to create a sense of depth. So for the two trees in what I wanted to make look like a background I stamped the trunks using Early Espresso (as I did for all of the trunks) and then used Emerald Envy for my first layer (as I did for all of the first layers) but then I added the accent layer using Tranquil Tide whereas for the front trees I used Lemon Lime Twist. By using the little flurry of snow stamp in the same set by part inking* it I managed to create a kind of hill effect which gave depth and distance to the trees in the background. Adding the tip of a tree in the bottom right corner also added to the sense of depth. I envisaged this looking a little winter wonderlandy and I was quite pleased to have pulled it off. This card was my prototype so will be improved upon should I make more but I was pleased enough with it to add it to the challenge. After I'd done with the trees I dotted around a few stars using Daffodil Delight to add to the festive feel. I covered the whole of the card front in Vellum which I attached along the edges using snail adhesive. 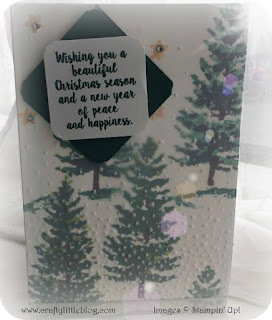 Before attaching the vellum I put it through the Big Shot with the Softly Falling embossing folder and think it really added to the snowy winter wonderland theme of this card. It gives texture and really does look like falling snow. It's fab! 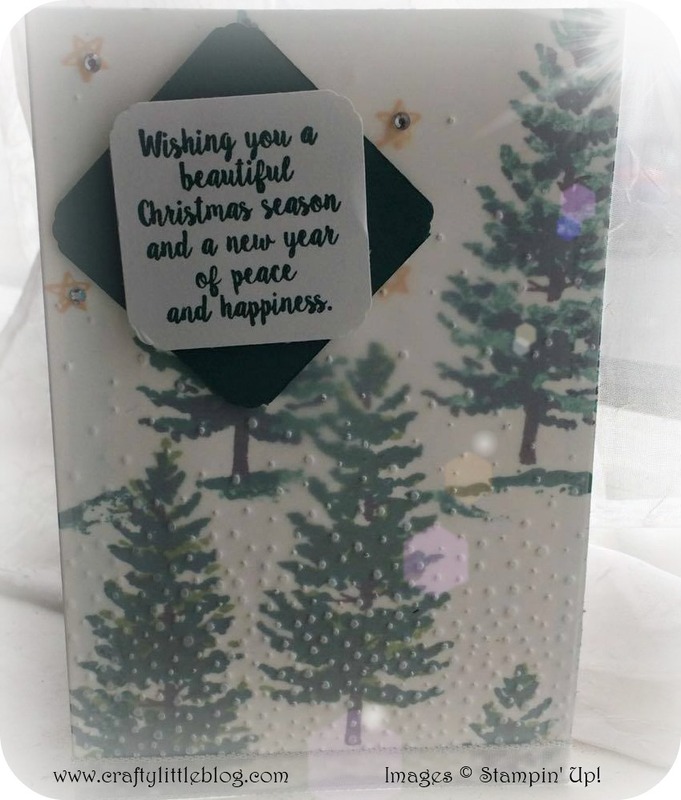 I popped a few rhinestones into the centre of the stars which were still fully visible after I'd added the simple layered offset squares with the sentiment from Season Like Christmas stamped in Tranquil Tide. I layered these with dimensionals. I simply cut a 2.5 square from Tranquil Tide cardstock and a 2 inch square to fit on top. I used a corner rounder which is not Stampin' Up! because they don't make one... and really ought to. Final touch was to add a little strip of ribbon across the bottom to add a little sparkle from the silver edging to balance out that from the stars at the top of the card. Everything I used is linked below and is all currently available. For some reason the 3/8 inch 1cm Metallic Edge Ribbon in silver is not on the listing but it is available in the catalogue and online. It also comes in gold. Thanks for dropping in, I'm feeling all festive and in need of chocs and a cuppa now. Do check out all of the other entries and the design team's inspiration on the Joy of Sets Challenge Blog and why not submit an entry yourself? I'm totally new to card making but love taking part and nobody laughs at my attempts. There are some truly inspired ladies on the team who make some stunning cards. Thank you Jane. I enjoyed making it. Another pretty card Andrea, I really enjoy seeing your designs. Sadly it doesn't fulfill the criteria of the challenge without the "W" stamp set so can't be added to the judging list.